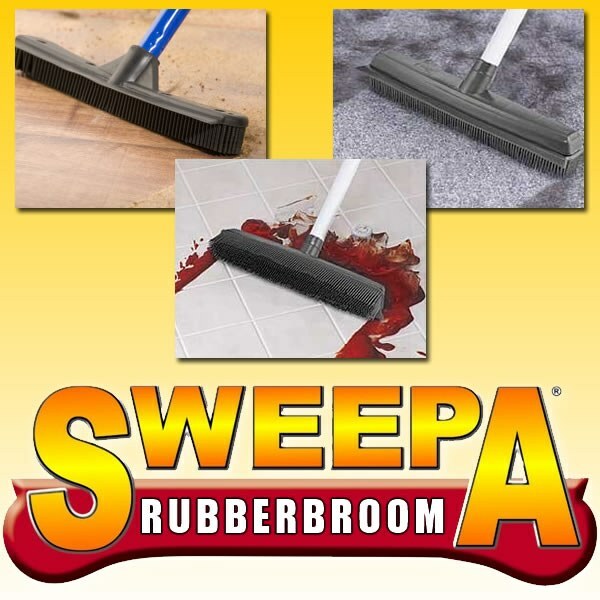 100% natural rubber broom with built in squeegee. 100% natural rubber broom with built in squeegee. Can be used wet or dry. Rubber broom attracts dirt,hair,dust & garden leaves. Use indoors on carpet, tile, linoleum, hardwood & even shower floor. Use outdoors on patios, garage floors & more. I DO LIKE HOW IT WORKS. I HAVE 3CATS,LOTS OF HAIR IN CARPET-HELPS GET IT OUT BETTER THAN A VAC.SWEEPS UP VERY WELL. A GOOD PROD. We use it to sweep and mop. It works great. I used this broom to sweep the kitty litter that the cats strew everywhere,works better than my broom not only for sweeping but goes in the dustpan better too--we also used it for sweeping all the snow off many cars,extendability really helped out in that aspect. My parents have been staying with us and they brought their SIX dogs! (That gives us 9 in a small space) Someone had given them this broom as a gift and I just can&apos;t say enough! This thing picks up every single hair and the dirt too. Sweeping is easy and a dustpan handles the pick up. I thought my floors were clean before, but this was a god send! I recently bought two for myself because I cannot imagine going back to my old broom. A must have for any pet owner. We have hardwood and linoleum but I do use it on my basement stairs which are carpet. Good for picking up dirt and animal hair. This incredible technology of sweeping with a rubber broom is amazing, it picks up all of the pet hair and it sticks to it. Would not allow the pet hair to fall off of the bristles making it much easier to sweep up all the minimal dust and other tiny loose hair. I love this broom to get snow off my car. Works well to remove roof snow because the handle extends. The squeegee side is great to clean off the windows, too. I was worried it wouldn&apos;t be as good as the OneSweep broom that I had in the past, but the handle is much more sturdy than the OneSweep. The fact that the handle collapses makes it easier to store in the car. The bright yellow color makes it easier to see, too. I hate dog hair and this gets it all in one sweep! I use this for all hardwood floors, tile for removal of all pet hair and dirt. It works well. The handle is a bit flimsy. Works well on Pet Hair inside and Cob Webs on the outside. best broom for pet hair! I bought two of these amazing sweepers. One for my salon and the other for the house. In the salon, it sweeps up hair so much better than a conventional broom. In our home, we use it to fluff the carpets in the areas where heavier traffic is. I use it before I carpet clean to get pet fur out of my low pile carpet. Before, even with vacuuming, my carpet cleaner would clog with so much fur from the carpets. I went over my carpets with my vacuum and had a small pile of fur that was picked up, then went over them with the Sweepa and the pile of fur was more than triple the size! It gets fur that is trapped deep down in the carpet fibers out and makes a HUGE difference! I also use it to get the fur off my fabric couch and to clean my tile floors. The telescoping handle is great because I&apos;m short and most broom handles are awkwardly long. Small downside: the handle screws into the rubber piece, but the rubber is flexible and doesn&apos;t always hold firm. Solved by cable tying the piece onto the handle. Use it to sweep leaves and other debris off my back porch. Also use it to sweep all my bare floors in the house. Once you figure out the best way to use the broom(short strokes forward for carpet cleaning), it can&apos;t be beat for pet hair. I have two long haired dogs and a long haired cat, so pet hair is a big issue with me. It also works on wood floors, tile, linoleum and concrete. I find myself using this broom every day!